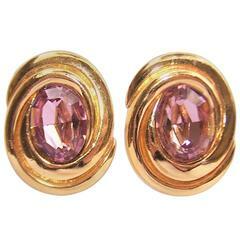 These detailed gold tone metal clip on earrings offer the look of fine jewelry at a costume jewelry price. The .88" diameter earrings are fashioned as a swirled rope design with cabochon style embellishments in red, green and black. Excellent condition with no maker's mark though the high quality of signed costume jewelry.